Enjoy, explore and consider its various apspects. and unreality, reflected from reality. and at last, the inner me merged with the outer me. Once again, I became as I am. Fantastic triplet...you words are beautiful. "The inner me merged with the outer me..Once again, I became as I am." And you are a beautiful you. Thanks for stopping by and leaving your thoughts Susie! I sincerely appreciate them, and I'm so happy you liked my offering for our first Wednesday Wake-Up Call! "Fantastic triplet..." Thank you so much! The veracity of your words struck me, the images and music gorgeous. I'm enjoying your triplets. Thank you for the prompt and for your community building efforts, they're so admirable. Hi there Anna! Thanks so much for stopping by and sharing your kind thoughts and words! So happy you like my 'triplet' form of presentation! Doing all I can with Natasha to bring folk together for their mutual benefit, support and creative sharing! And thank you for stopping by Fred and sharing your thoughts! So glad you like this 'triplet' presentation! I really enjoyed the video, too, especially with the 'quirky' stop/action sounds combined with the satellite dishes. Thanks again Fred! It's always great to connect with you across time and space! Your words--such a profound overview of inner and outer self; plus the amazing artistry of Maxfield Parish, and that incredible video choice-- some of the images are breathtaking! A perfect triptych!! Nicely done! Thank you so much for stopping by and viewing my work Ginny! Your comments are sincerely appreciated, and I'm so very pleased you liked my presentation! 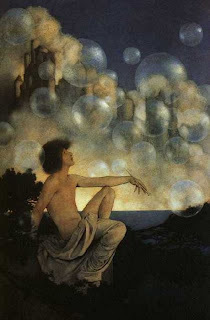 This is wonderful, Maxfield Parrish has long been a favorite, perfectly paired with your words and the video... thank you! So glad you liked my offering! Sincerely appreciated, and yes, Maxfield Parrish is a rarity and my fav too! Exquisite art from him! To me he paints a beautiful world of possibilities! A world, so far, only found in his paintings!